In June 1993, the first edition of De Actuaris, the magazine of the Royal Actuarial Society (AG), was published. De Actuaris is characterized by its (socially) relevant actuarial, economic and financial issues discussed via variable thematic perspectives. 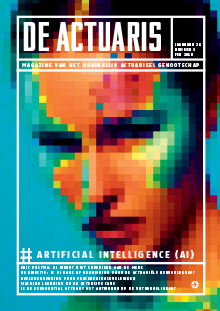 De Actuaris is distributed amongst members and stakeholders of AG, subscribers, stakeholders, students and teachers of the Actuarieel Instituut (AI). By advertising in De Actuaris you will reach the entire actuarial field in the Netherlands. The magazine is an excellent platform for your advertisement, product or corporate communication. If you are looking for actuarial specialists, our magazine is a logical choice to give your organization’s profile extra prominence. If you are interested, please contact Maarten van Meerten (+31-(0)30-6866153). Upon publication you will receive an issue as proof along with the invoice. Deliver your advertisement as PDF (high-res. ), full colour (CMYK). In case of a descending ad: 4 mm all around (size becomes 218 x 305 mm). Your PDF is to be send by email to Maarten van Meerten. Articles are to be send digitally to Frank Thooft, manager magazine. All contributions are first assessed by the editors. The author always receives proof of his or her final article first before proceeding with publication. For more information about submitting and deadlines of copy you can download the author instructions. The editorial staff of De Actuaris consists of professionals (formally) active in the actuarial practice, facilitated by a magazine manager. The editors are jointly responsible for the publication of the magazine. For information about the magazine or a subscription, which costs 62,50 euro (excl. VAT) a year per volume, please contact Pascale Mandjes-Heese (+31-(0)30-6866154).